There have been several posts lately in other Revit blogs about elements that don’t carry equal status in comparison to others. I’m going to add Roof Soffits to this. You can’t even schedule them in a multi-category schedule. You can schedule fascias, gutters, roofs, wall sweeps, slab edges and all your standard categories, but not roof soffits. 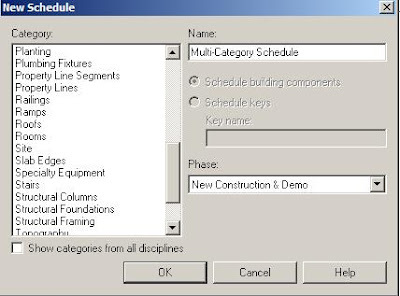 You can’t also do a direct schedule on generic elements, but you can schedule them using a multi-category schedule. can you add walls to a multi-category schedule? i've been trying with no success.